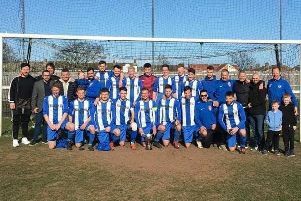 It was a joyous occasion and UTS supporters were hoping for their side to put the icing on the cake by registering a 24th win of the season before cracking open bottles of champagne. However whilst the Gateshead-based outfit were looking to complete a ‘dream’ evening, they came up against a resilient Ashington side who gave every ounce of energy in a display which was brimful of guts, determination and commitment. Admittedly UTS did squander opportunities to win it but party poopers Ashington – who sportingly gave the home side a guard of honour beforehand – were full value for a share of the spoils. What made the point even more commendable on the night lay in the fact that Interim manager Ian Skinner had seen his squad decimated due to injuries, working commitments and other reasons. The pace of the game never relented throughout and it was the visitors who forced the first opening in the tenth minute through Jack Butler and Sammy Perez but the latter’s cross was cleared. At the other end, Liam Brooks saw his effort clutched at the second attempt by ‘keeper Conor Grant and in the 18th minute, it was the stopper who was solely responsible for the score sheet remaining blank as he made an astonishing double save to deny Mark Fitzpatrick and Michael Pearson. Fitzpatrick did have the ball in the back of the net in the 26th minute but was ruled offside then Aidan Hutchinson cleared off the line following a free kick taken by the home side. Before the interval, Pearson headed over from a cross by Jack Elliott then Grant saved from Brooks when he looked a certain scorer. *After the final whistle, Dunston UTS skipper Daniel Halliday was presented with the first division trophy by ENL president George Courtney. *On Saturday, Ashington conclude their season when they travel to face West Auckland (3pm).